The biggest reason that I chose this picture (other than the look of horror on the Utah defender’s face, but we’ll get to him later) is my love for the history of the Indiana Pacers and specifically their Championship days in the ABA. As time goes by with season after season coming and going without the Pacers winning the NBA Championship, my admiration for the teams led by a trio of recently ordained Hall of Famers in Roger Brown, Mel Daniels, and head coach Bobby Slick Leonard continues to grow. It’s incredibly hard to win one championship, and those Pacers won the ABA title three times in four years and made it to the finals in five of the ABA’s nine seasons. All the more impressive when the NBA Pacers have only reached the Finals once in the nearly 40 years since the merger. Yes, the ABA was a smaller league with only 10 teams, but the NBA’s size wasn’t much larger back then either, and no one diminishes the Celtics dynasty during the sixties when there were only 8-9 teams in the league. I wish I was alive to see those Pacers teams play. My curiosity with these guys started with seeing Brown, Daniels, and George McGinnis’ numbers in the rafters, retired (the only guy that’s earned that recognition from the Pacers since is Reggie Miller), and it’s grown since in recent years with the Roger Brown Documentary and having the chance to briefly meet some these players at Pacers events (Mel Daniels has the world’s strongest handshake). One of my favorite parts about going to a game is seeing Darnell “Dr. Dunk” Hillman around the arena. In terms of context for when the photo was actually taken in terms of what season, playoffs, regular season, etc. I have no idea. I know the Pacers never played the Utah Stars in the ABA Finals (they did beat the Los Angeles Stars for their first ABA Championship), but the Stars were the team that won the championship in between the Pacers three titles. 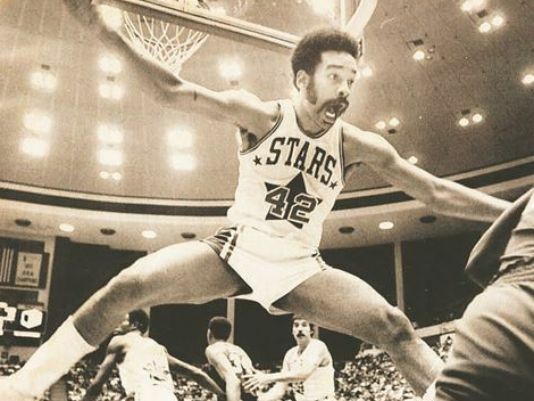 In that season, the Stars actually beat the Pacers 4-3 in the ABA semifinals. The Pacers beat the Stars in each of the next two seasons in semifinals, so this was a classic matchup between two very good teams during the Pacers greatest era. The Stars and the Kentucky Colonels, two teams that were not selected for the merger, were probably the Pacers biggest rivals from these days. The man with the ball is Roger Brown, the first ever Indiana Pacer thanks to a recommendation from Indiana-native Oscar Robertson. Brown was banned from the NBA after being linked to notorious gambler Jack Molinas even though Brown was never charged with anything and proof wrongdoing was never uncovered. Because of this, Roger Brown is the best basketball player that most people have never even heard of. Often considered as one of New York City’s best high school players ever (sorry, Born Ready) and perhaps the best player in the ABA’s history even with him losing six years of his prime playing years because of the non-scandal. The Rajah, as his coach would call him, could always be counted on for a basket when the game mattered most and especially in the playoffs. If you ever get the chance, watch the documentary Roger Brown: Undefeated. Unfortunately, Brown died in 1997 from liver cancer and never got to enjoy his entrance into the Hall of Fame in 2013. I asked Daniels (in the far left in the photo watching the Rajah work), who made the HOF the year before, if he was glad that Roger was joining him, and he immediately became choked up saying how he wished Brown was alive to see it. You can really get a feel for how much his teammates and coaches cared about him and each other in the documentary. They were an incredibly close group of former teammates. We have too much Redbull Wise above and too much red wine Wise to the left (Yes, yes, I know Redbull didn’t exist then, so I guess I’m saying that Wise is a time traveler that for unknown reasons only used his powers to occasionally grab an energy drink from the future to try and deflect a pass). I didn’t know much about Wise before I started looking for who the Utah player was from the picture, but he’s the most photogenic basketball player in the sport’s history. He averaged a solid 18 points, 8 rebounds, and 3 great pictures per game. Here’s one last one of him watching Dr. Dunk sky over him for his namesake slam. He’s surprising calm in this one for a man about to be put on a poster (must have been before he started his energy drink time travel). This photo is glorious, but back to the one at hand. One final note to touch on: The Pacers uniforms from this era are one of my favorites the team has ever donned. The stripes are such a different and original look for a uniform, and it makes me even more disappointed that the Pacers haven’t gotten rid of their current, boring jerseys that it feels like they’ve had for ages. I’m highly doubtful many fans would be disappointed to see these brought back full time or the FloJos or the pinstripes, or the jersey from the late eighties. Oh, and God bless the ABA for the 3-pointer.